If you’re living in London and looking for something a little different to do on a day out, then why not try a barge tour on the Grand Union Canal or the Regent’s canal. 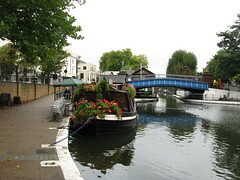 Little Venice and Maida Vale are found just west of the city centre and offer a tranquil residential area intersected by canals and waterways that offer great cruising and a perfect day out. Part of the charm of living in London is being able to find a range of activities right in the heart of the city. The waterways and canals of this area were once busy transport routes to to the rest of England, but today offer a boaters paradise. The banks of the canals are dotted with country pubs and fabulous restaurants and eateries and you can hop on and off the barges that make their way up the meandering rivers. If you have family and friends visiting you while you are living in London, then a day trip on one of the river barges is a real treat. The barges are beautifully decorated and painted in bright colors reminiscent of a bygone era when the rivers played such an important part in the development of the city. The best time to visit the Grand Union Canal is in the spring months. In summer this area is quite crowded and you’ll have to book in advance to make sure you get a reservation at a restaurant or on one of the barge tours. In spring though, you can enjoy a perfect day out with plenty of sunshine and without the crowds; the area is undergoing massive development in the Paddington Arm which will be on the scales of the urban renewal projects of the docklands, so if you really want to enjoy and oasis of tranquility, mark this down on your list of things to do while living in London.